Many large companies are deploying new IT solutions, such as cloud technologies to deliver improved access to data, mobile technologies to support more personalized user experiences, and enhanced security platforms to address ever-growing threats of unauthorized access. 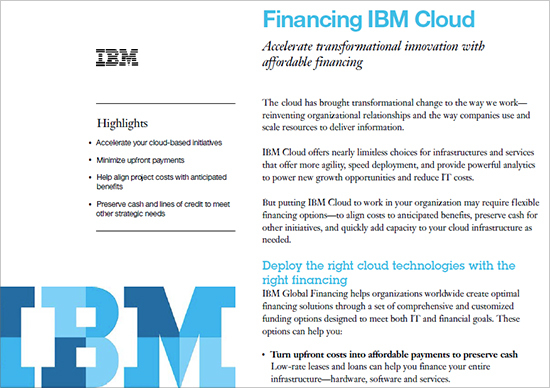 These solutions can be highly complex, so when it comes to financing transformational IT initiatives, many traditional bankers can’t provide flexible financing options, nor understand specific funding needs for long-term projects. 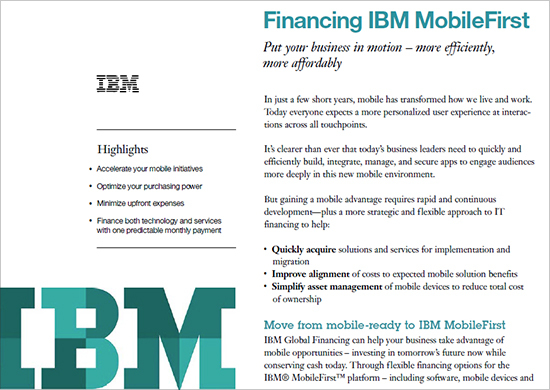 The IBM Global Financing division of IBM offers expertise in financing these solutions in a way that minimizes initial upfront costs, aligns costs to benefits, and provides single-source financing for complex initiatives that cover both IBM and non-IBM suppliers. 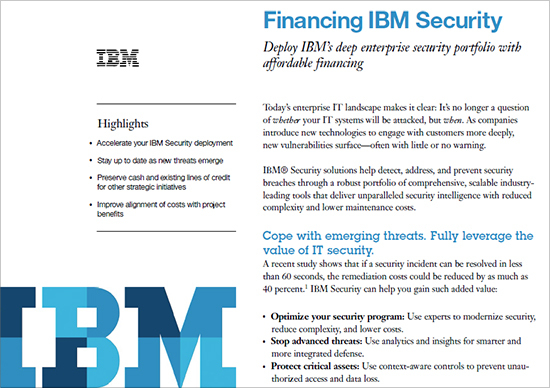 These solutions briefs present IBM Global Financing as experts in IT financing, providing information on various funding options that can be easily customized to meet both short- and long-term needs, reduce costs, and accelerate deployment.